Vista, CA, September 24, 2018 — MedicalFieldCareers.com, a free online resource for students training for careers in healthcare, has announced its list of the Top 35 Affordable CNA Programs for 2018-19. “Nurse assisting is one of the most popular entry level fields in healthcare and MedicalFieldCareers.com felt that it was important to recognize the programs from around the country that provide the greatest value to students,” said Matt Bromley, MedicalFieldCareers.com owner and webmaster. The schools featured on MedicalFieldCareers.com's Top 35 Affordable CNA Programs list appear below. 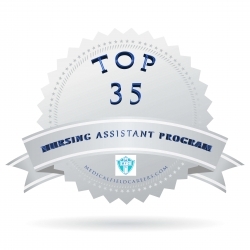 To learn more about the schools featured on this list, and to review the methodology used, visit the Top 35 Affordable CNA Programs list on MedicalFieldCareers.com. MedicalFieldCareers.com is an online provider of free information on healthcare career training, certification requirements, and salary and employment outlooks by region. All data featured on the site is pulled from official U.S. Government sources. All training programs and educational institutions featured on the site are accredited by major national accrediting bodies.